Fintech, an abbreviation for financial technology, is most certainly one of the hottest new trends in the digital age. Why? Well, because it comes with the promise of radically changing the way we live and conduct business. These fintech firms and startups are leveraging technology to provide products and services typically offered by bank and financial institutions that are more innovative and much cheaper. At the end of the day, fintech will benefit the consumer who will get lower prices, more innovative products and better user experience. The fintech craze has been particularly visible through the growing amount of cash that has been injected in the sector with more than $25 billion being poured in the past five years, making it the number-one target for venture funding. 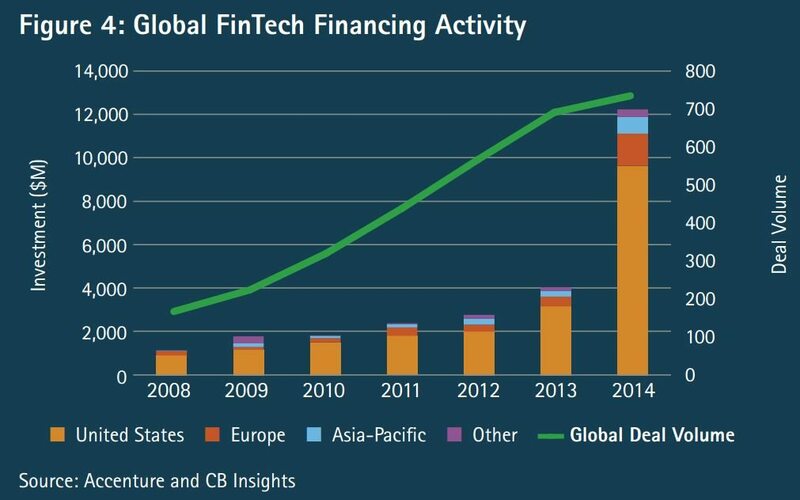 In 2014, investment in fintech companies grew by 201% globally, compared to 63% growth in overall VC investments, according to a report from the consultancy firm Accenture. 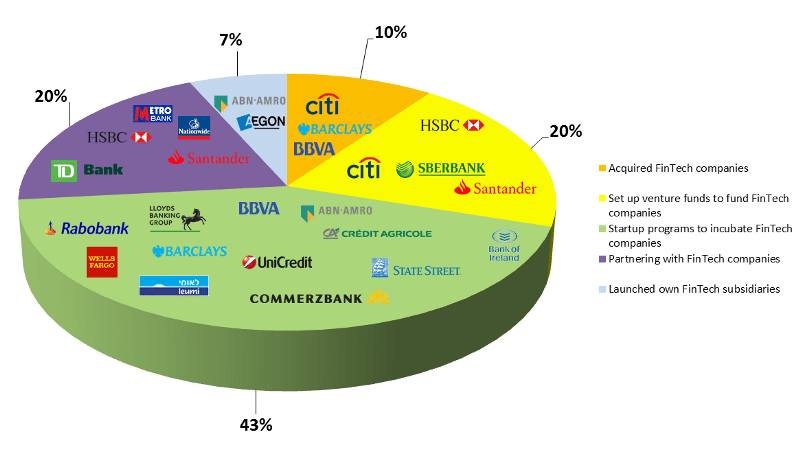 The EIU estimates that there are approximately 4,000 companies challenging banks in every product line in their portfolios. Sub-sectors such as peer-to-peer lending, global money transfer, mobile payments and crowdfunding in particularly taken off and given birth to billion-dollar companies. According to CB Insights, a venture capital database and angel investment database, there are 15 financial technology startups that are now unicorns. The aggregate valuation of all 15 of these fintech companies equals almost $49B, which is roughly 10% of the aggregate value of all 130 unicorns as of August 27, 2015. Although the majority of these unicorns are from the US and the UK, a growing number of Chinese and Indian firms are joining the billion-dollar club. Lufax (China): Lufax is an online lending platform that has arrangered over 200,000 peer-to-peer loans worth US$2.5 billion. Lufax is valued at US$10 billion. Square (US): Square is a payments startup known for its credit card-reading devices. Square is valued at US$6 billion. Stripe (US): Stripe is a payments startup that allows online businesses to accept credit card payments and connect to its API to improve and customize their payments services and management. Stripe is valued at US$5 billion. Zenefits (US): Zenefits is a human resources platform that provides, among other things, businesses quotes on life and health insurance policies. Zenefits is valued at US$4.5 billion. Social Finance (US): Social Finance is a marketplace lender and the US market’s largest provider of student loan refinancing. Social Finance services over 2,200 schools and is valued at US$4 billion. Credit Karma (US): Credit Karma allows consumers to track their credit scores and manage credit information. Credit Karma is valued at US$3.5 billion. POWA Technologies (UK): Powa provides payment and infrastructure technology to the e-commerce industry. Powa is valued at US$2.7 billion. Adyen (Netherlands): Adyen is payments startup that powers payments for Uber in over 50 countries. Adyen is valued at US$2.3 billion. Klarna (Sweden): Klarna provides payments services to online businesses. The startup, which operates in 18 countries, is valued at US$2.25 billion. One97 Communications (India): One97 Communications is an Indian m-commerce company. Its main product, Paytm, is a mobile wallet service and marketplace that is serving 20 millions users. One97 Communications is valued at US$2 billion. Prosper Marketplace (US): Prosper is a peer-to-peer lending marketplace that has over two million members. Prosper is valued at US$1.9 billion. TransferWise (UK): TransferWise has developed a technology to transfer money overseas with minimal fees. TransferWise is valued at US$1 billion. China Rapid Finance (China): China Rapid Finance is a marketplace for loans that targets China’s growing middle class. China Rapid Finance is valued at US$1 billion. Coupa Software (US): Coupa Software offers a cloud-based system that allows companies to track expense reports, procurement contracts, invoices, inventory contracts, and other functions, and better control their costs. Coupa Software is valued at US$1 billion. Funding Circle (UK): Funding Circle is a lending service targeting the small-business loan market. Funding Circle has loaned roughly US$1 billion and is valued at US$1 billion. Today, fintech is a subject of strategic importance in the financial services industry, and all major banks are tackling the challenge through diverse strategies. A recent survey from the EIU calls for a ‘fintegration,’ suggesting that banks and fintech startups have more business interests in common and should consider to collaborate and benefit from either others’ strengths. Although fintechs are not about to kill off traditional banks, they are expected to take a bite out of each part of their product portfolios, and that, for the best of consumers. Image credit: Fintech Innovation, Shutterstock.com.